The Ukoy recipe shown here is made from mongo sprout(togue) and shrimps. 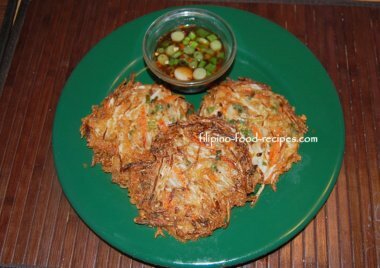 Sometimes called Okoy, it is the Filipino shrimp fritter. It is a fried and battered mix of shrimp and vegetable, either mongo sprout(togue) or squash(kalabasa). This particular recipe is made with togue since I am not a fan of sweet squash fritter, but that's just a preference. Traditionally, shrimps are not shelled and heads are left intact as they are fried to a crisp. But if you are unable to fry the shells crispy or bothered by swallowing them, I suggest you remove them before adding the shrimps to the batter. You could pound the shells, add a little water to make shrimp juice and mix that with the batter for extra shrimp flavor. I also like my shrimp fritter with carrots that's cut into strips or julienned. I try to sneak in carrots in any dish, as long as it will not affect the taste. Anyway, a little carrot won't make the batter sweet. Other Asian cultures, like the Thais and Malays, have their own version of the shrimp fritters. They're also street food and fried crispy. So how can you tell if it's a Filipino shrimp fritter? It's the dip that comes with it. Ours is almost always served and eaten with a vinegar, garlic and soy dipping sauce. Yum!!! 1 Mix all the ingredients together except the cooking oil. 2 Heat up a some oil in a pan. 3 Using a 1/2 measuring cup, scoop the batter onto the hot pan, and flatten with a spatula. 4 Pan fry for 3-4 minutes per side or until golden brown. 5 Depending on the size of the pan, you could cook from 2 to 3 at a time. 6 Serve with a vinegar dipping sauce on the side. Cook the fritter using medium low to medium heat to cook the inside and center properly. Try to pierce or prick the center so oil will seep in and cook the fritter well. An easier way to infuse shrimp flavor onto the batter is to use Knorr shrimp cube. Heat up the 1 cup water in the microwave with the shrimp cube to dissolve before adding to the batter(but omit the salt in the recipe as the cube is already salty). 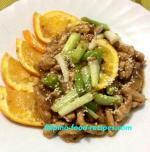 You could freeze leftover Okoy for later use. Just bake them using an oven or oven toaster at 425 °F for 10 to 15 minutes or until crispy.